Any information on the NGPI Takeover Offer for Kingsgate will be listed on this page. season commenced in September 2016, and forms part of a previously announced US$3 million exploration budget for FY17 which will focus on district targets separate from the three existing resource areas. For the balance of the 2016/17 season exploration will be focused on detailed geological mapping, surface sampling, Air-Blast and RC drilling. Kingsgate Consolidated (ASX:KCN) (“Kingsgate” or the “Company”) has been made aware of some alleged recent comments by the Thai Minister of Industry reported in the Thai media that relate to the premature closure of the Chatree Gold Mine on 31 December 2016. The Thai Cabinet has instructed the Ministry of Industry to consider the impact of the matter on the Free Trade Agreement between Thailand and Australia. Neither Kingsgate nor its Thai subsidiary Akara Resources Public Company Limited, have received any communication from the Thai Government in relation to these matters, and accordingly are unable to assess what weight, if any, should be given to these remarks. The media reports themselves are contradictory in certain respects, and the Thai press should not necessarily be regarded as a reliable source of information of this type. Kingsgate Consolidated’s (ASX:KCN) (“Kingsgate” or the “Company”) Thai controlled subsidiary, Akara Resources Public Company Limited (“Akara”), will today submit an application for a 5 year renewal of the Metallurgical Licence for the Chatree Gold Mine. This renewal application follows an announcement by the Thai Government in May 2016, to only extend Akara’s Metallurgical Licence until 31 December 2016. Lodgement of a renewal application for the Metallurgical Licence is required to be made by 60 days prior to its expiration under Thai Law. There can be no assurance that such an application will be successful. Kingsgate continues to push for remedies to the premature closure of the Chatree Gold Mine. In addition, Akara has also released a Community Survey taken across approximately 1,800 households in the vicinity of the mine that was undertaken in accordance with the Thai Department of Primary Industries and Mines “Social Licence to Operate” guidelines. The Community Survey reported a high satisfaction rate with the Chatree Gold Mine and its operations. The Directors of Kingsgate Consolidated Limited (ASX:KCN) (“Kingsgate” or the “Company”) have today unanimously advised shareholders to REJECT the opportunistic and inadequate proportional takeover offer by Singapore-based Northern Gulf Petroleum International Pte. Ltd. (“NGPI”) of 4.2 cents per Kingsgate share. In the Target’s Statement released to Kingsgate shareholders today, the Directors advise that Grant Thornton Corporate Finance, acting as an Independent Expert, has concluded that the offer is NOT FAIR and NOT REASONABLE. This conclusion supports the view held by the Kingsgate Board that the NGPI offer significantly undervalues the Company. The offer is materially lower than the Independent Expert’s value range of 27.9 to 42.0 cents per share. It also fails to recognise Kingsgate’s improved prospects and financial position; is highly opportunistic in its structure and timing; and ignores the strong potential of Kingsgate’s flagship asset, the Nueva Esperanza Gold/Silver Project in Chile. The Bidder’s Statement is unclear and uncertain regarding the future operation and growth of Kingsgate should NGPI gain control. the inadequate and unsolicited takeover offer by Northern Gulf Petroleum International Pte. 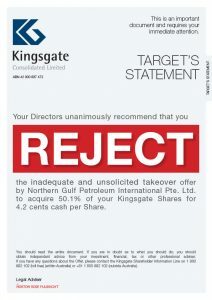 Ltd. to acquire 50.1% of your Kingsgate Shares for 4.2 cents cash per Share. You should read the entire document. If you are in doubt as to what you should do, you should obtain independent advice from your investment, financial, tax or other professional adviser. If you have any questions about the Offer, please contact the Kingsgate Shareholder Information Line on 1 800 882 102 (toll free) (within Australia) or +61 1 800 882 102 (outside Australia).